There is a genre of videos coming out of Syria that could be called “looking through the window” video, where people pull the curtains and record what is happening right outside of their window. There have been similar videos from other recent uprisings, showing the treatment of the protestors by the police in quiet streets and alleyways etc. In Syria, tanks are roaming through the streets, massacres are happening right across the sidewalk. In the tradition of news reportage, most of these videos provide a voice over that aims to contextualize the image. In Areeha | Idlib | FSA Destroys Regime Tank, a recent post on SyrianDaysOfRage’s youtube channel we can see the explosion of a tank captured on the camera of a citizen reporter. First we see the street through the window, a tank enters the frame from the right side and is hit by a missile. It immediately catches fire and accelerates, while the civilian reporter stops the narration and repeatedly chants allahu akbar. The tank goes behind a tree and explodes right outside of the window, over-exposes, pixelates and wipes out the image briefly at the moment of explosion. Shattered pieces of the tank scatter over the rooftops, and fall right outside the window, the camera [man] is moved by the shockwaves and the video ends with the image of red drapes at the corner of the window, while the man still chants allahu akbar. This is one of the most dramatic and intense videos of this kind, showing a city turned into a war zone. This form of newscast, unmediated by the figure of the reporter in front of the camera, with his/her back to the event, has become an accepted format in journalism. Now there is nothing between the journalist and the event, and all Syrian buildings and interiors have become news headquarters, and all civilians war correspondences. 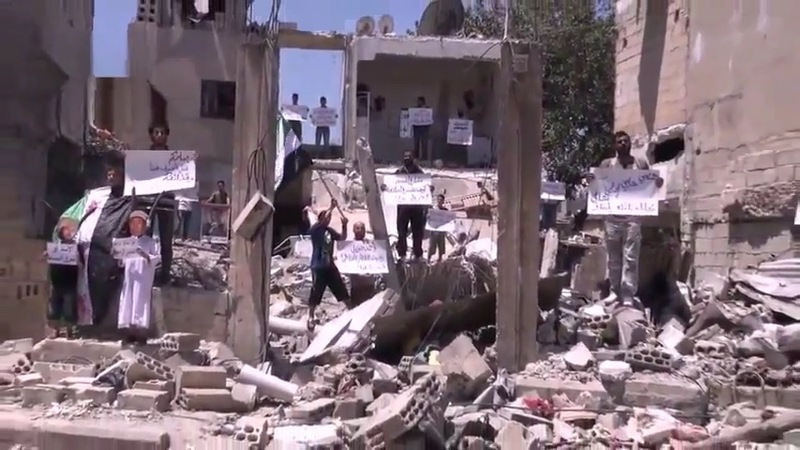 Syrian windows have become screens opening to a theatre of destruction.